For more than two decades, New York City's five organized-crime families were plagued by convictions brought on by strengthened federal laws and the increasing habit of higher-ranking members cooperating with the government. Those years of high-profile decline created a perception that the city's mafia is on the verge of extinction. But law-enforcement officials and mob experts say the five families, while not the force they once were, are far from sleeping with the fishes. They have survived, the experts said, because of their persistence and ability to adapt. "I don't know that I'd say La Cosa Nostra was what it was in its heyday but I wouldn't say by any means it's gone away," said Richard Frankel, special agent in charge of the Criminal Division for the Federal Bureau of Investigation's New York office. 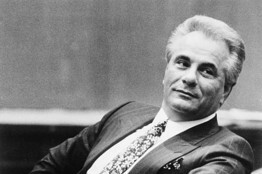 Reputed Gambino family crime boss John Gotti leans back during a break in testimony in New York Supreme Court in Manhattan, Jan. 23, 1990. Mr. Frankel, who supervises the FBI's organized crime squads in New York, said he believes the city's Cosa Nostra has quietly staged a comeback and is now more powerful than it has been in years. Despite the waves of prosecutions, each of the five mafia "borgatas"—the Genovese, Gambino, Luchese, Bonanno and Colombo—"still exists and each still has its hierarchy," said John Buretta, a former federal prosecutor who headed the organized-crime unit for the U.S. attorney's office in Brooklyn. One recent indictment that attests to organized crime's staying power, authorities said, is the Jan. 23 arrest of 78-year-old Vincent "Vinnie" Asaro, in connection with the 1978 Lufthansa heist of $6 million in cash and jewels at John F. Kennedy Airport. The reputed Bonanno captain and four other reputed Bonanno members were charged with running a loan-sharking, extortion, gambling and murder enterprise from 1969—nine years before the Lufthansa robbery—to the present day. The defendants have pleaded not guilty. The five families are no longer the federal government's top criminal concern in New York City. Counterterrorism and other criminal networks—such as Russian, Balkan, Asian and African organized syndicates that generally coexist peacefully and sometimes collaborate with the five families—have attracted investigators away from La Cosa Nostra, Mr. Frankel said. Years ago, the FBI had a squad dedicated to each family. Now there are two: C-5, which handles the Genoveses, Bonannos and Colombos, and C-16, assigned to the Gambinos and Lucheses. A 2010 audit by the Justice Department's Office of the Inspector General found that after Sept. 11, 2001, organized crime is the FBI's sixth priority behind terrorism, espionage, cybercrime, public corruption and protecting civil rights. At the NYPD, amid budget squeezes, the current 5,000-detective headcount is about 2,000 below the 2002 level. There has been an "across the board" reduction of detectives in precincts and specialty squads including organized crime, said Michael Palladino, president of the NYPD's detectives' union. The number of detectives investigating organized crime has remained stable in the past three years, though. The NYPD didn't return a request for comment. As the ranks of organized-crime investigators decreased, the mafia adapted to law enforcement's investigative techniques. Unlike the in-your-face approach that media mob star John Gotti adopted in the 1980s, today's mafia has reverted to its roots and tried to become as invisible as possible, officials and experts say. For instance, the Genovese family, which has traditionally been the largest, most powerful and most secretive, now likely uses a rotating panel of leaders to run day-to-day affairs to avoid any one boss from being targeted by prosecutors, Mr. Buretta said. Other crime families use a "street boss" model where lesser-known mobsters carry out the orders of imprisoned leaders, he said. Today's crime families are also less territorial and more open to collaboration than the mobsters of past decades, said Inspector John Denesopolis, the commanding officer of the New York Police Department's Organized Crime unit. "As long as they are earning, they are less concerned," he said. Another emerging trend in the past several years, Mr. Denesopolis said, is mafia families emulating the need-to-know tactics seen in terrorist cells—one group in the family isn't made aware of what crimes another group in the same family is involved in. What hasn't changed much since the 1930s are the five families' bread and butter crimes: loan-sharking, extortion, gambling, narcotics and infiltrating organized labor, Mr. Frankel said. They aren't as involved in sophisticated financial frauds—such as stock pump-and-dump scams—as they were in the early 1990s, Mr. Frankel said. But they are resourceful when it comes to new opportunities, he added, citing recent prosecutions of offshore Internet gambling websites and trafficking in Viagra. Hundreds of inducted members in the five families are still behind these enterprises. The Genovese lead with close to 200 such "made" men, while the Colombos and Lucheses are the smallest, with about 100 each, said Jerry Capeci, a longtime crime reporter who operates the website Gang Land News. The numbers are less than years ago but not substantially so, he said. There are also several thousand additional criminal associates, Mr. Denesopolis said. Leadership ranks are also being replenished as many "sophisticated, capable" mafia veterans who are currently incarcerated will soon complete their sentences, said Mark Feldman, chief assistant Brooklyn District Attorney and a former chief of the Brooklyn U.S. Attorney's organized-crime unit. Law-enforcement officials say one trend has worked in their favor lately: the growing frequency of soldiers and leaders breaking oath of Omerta—the pledge allegiance to the family and agreeing to a code of honor that includes a vow of silence if arrested. In 2004, Bonanno leader Joseph Massino shocked the underworld by becoming a government witness—the first head of one of the five families to do so. He has testified or provided information against other accused mobsters in several cases, including in the latest Lufthansa heist charges. He testified against reputed Bonanno leader Vincent Basciano, who was convicted in 2011 on racketeering and murder charges. "Joe's cooperation had to shake the confidence in the code of honor in as dramatic a way as any cooperator ever had," Mr. Buretta said. A recently retired NYPD detective who worked organized crime for more than 20 years, said old-timers followed the rules "to the letter" and would never talk to him or his partners after an arrest. "With these young kids, the rules are just suggestions," he said. "They're younger, a lot of them have young kids and they don't want to look at 25 to life," he said. We sit them down and tell them, 'Listen, the next the time you pick up your baby daughter she's going to be 27 years old.' "